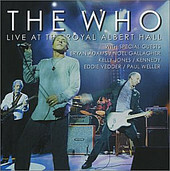 Recorded live at the Royal Albert Hall on November 27, 2000, The Who (still with John Entwhistle on bass), grow up and age gracefully, still putting on a solid, spot on live show that captivates audiences and does the hits without sounding like a nostalgic act. Featuring guest appearances by numerous celebrities, including Paul Weller, Eddie Vedder (a few times), Bryan Adams, and Noel Gallagher, Live at the Royal Albert Hall is a well put together, solid collection of some of your Who songs in a live format. Including "The Kids Are Alright" (with additional lyrics sung by Townshend), "Pinball Wizard", "Bargain", "Magic Bus", "Baba O Riley", and "Who Are You" - and that's just disc one. Here is a live, greatest hits collection (like most live albums are) that leaves virtually no rock unturned and contains many surprises that keep you coming back more and more. Still, it doesn't take the place of seeing The Who live! I'll give it a B+.